What a joy it is to relax all day long in this beautifully furnished Air-Conditioned Villa, this villa is built on a large 500m plot and is situated in a peaceful central location making the most of its day long sunny position, offering views of the Femes mountains and Atlantic ocean from the specially built large patio and raised chill out terrace area. Enjoy relaxing in the fully established garden area complete with garden furniture + sun loungers & designer heated swimming pool Prefer a night in? large flat screen TV complete with BBC 1,2 & 3 - ITV 1,2 & 3 Channel 4 etc: Wi-Fi and Internet Access. A £20 Welcome pack can be supplied for that all important Tea/Coffee and snack before you go on to explore this beautiful island, please let us know if you would require a welcome pack to be placed in the villa upon your arrival? Hi my name is Linda my partner Robert and I have been holidaying now in lanzarote since the year 2000. I fell in love with the island and especially with Playa Blanca and its beautiful romantic scenery so much I finally bought a holiday home here in 2003, I decided eventually to rent my villa out just so other people could see the magic this island has to offer I hope you feel the same way too. This property is in an ideal location far enough for the peace and quiet we all seek & long for, yet close enough to be in the heart of all Playa Blanca has to offer, South facing, bathed all day long in sunshine. Large American Designed heated pebble tec pool, ample well established garden and amazing 2 tier terrace space,with fantastic views. Large light and Airy modern marble and tiled Bathroom with bath / shower, bidet and w/c. Beautiful large Air-conditioned Lounge/dining room, with leather suite & dining table, 42" flat screen plasma TV with English channels BBC1-ITV-CHANNEL 4 etc: DVD player, I Pod Dock WI-FI Internet Connection Beautifully decorated and presented. There is a full range of music available via the TV. The nearest golf course is approx 15 minutes away in Tias. The villa is on the edge of a Gated private complex with Secure parking & is wheelchair friendly and not overlooked. Notes on accommodation: Welcome Packs can be supplied for your arrival High chair and Cot hire. FREE WI-FI Free Internet Access Transfers to & from the Airport subject to availability Outside: This villa boasts a large patio and barbecue area,it also has a raised chill out terrace area with mountain and sea views complete with outside garden furniture,all surrounding a very large private heated pool. Boasts plenty of space and receives the sun all day long. Towels and linen included, midweek clean available on request. They say there is no place like home but this lovely villa does everything it can to make it as close as possible with the added bonus of a sensational heated pool. What a luxury ! We visited as a couple but it would be equally ideal as a family holiday with children of all ages. Well equipped kitchen if you wish to cater for yourselves, comfortable bedrooms and a clean functional bathroom. The living area is comfortable and the patio/pool area is absolutely perfect for those long hot days spent outside. Playa Blanca is about 15/20 minutes walk away where there are a number of places to eat. A mini market is close by and there are several supermarkets in Playa Blanca itself. We enjoyed our week in this property. I think you will too. Stayed for 2 weeks in September 2018. Beautiful outside space and biggest pool we have ever had when staying in a villa. Short walk and you are on the beach front. Great restaurants, bars and shops all within walking distance. Villa in a great position. Villa looks just like the photos. Highly recommend. We stayed for a week in the villa. The terrace, patio and pool area are second to none. The loungers, seats, barbecue and pool were in perfect condition. Inside the villa was no different. Everything you need can be found in the kitchen, including washing machine iron and ironing board, loads of plates cutlery and all the pans you need. This villa is ideal for any type of holiday, couples (old and young) and familys. The villa is about 15 minutes walking distances from the local bars and shops, or 5 Euros in a taxi. Beautiful villa with gorgeous pool and gardens! We (4 adults (most of the time!)) spent 4 nights, including New Year's Eve, in this lovely villa! We had such a brilliant time we are doing it again next year! Unfortunately someone beat us to it on re-booking this villa so we are missing out! The villa has everything you need, a true home from home! The men were especially impressed with the TV and the channel selection as they were able to watch their beloved football! Us girls were more impressed with the gorgeous pool and outside grounds! Loads of seated areas to sit and look at the views with your morning coffee and watch the sunrise! You can see Playa Blanca and the sea from the top terrace and it was a great place to watch the New Year fireworks! We strolled into town in about 12 minutes, located all 3 supermarkets and grabbed a taxi back with our New Year supplies for under 4Euros! We ate alfresco every evening, making full use of the BBQ, and even made new friends with a pair of sibling kittens who came every day to say hello! Linda the owner was a pleasure to deal with from booking to arrival (even adding a couple of extra bits we wanted to our welcome pack as we were not arriving until late), and she was on-hand during our stay for any queries. I would highly recommend this villa and will definitely be back! Such fantastic news to hear how much you and your guests enjoyed your stay at the villa i have always tried to make it a home from home and hearing this is exactly how you felt, has made it all worth it! I am so sorry i could not accommodate you again this year, but hopefully we will to see you again in the near future. Casa Paula is only a 10-15 mins stroll to Playa Blanca Beach, the stunningly beautiful seafront promenade & the very heart of Playa Blanca town centre. Beaches Dorada and Flamingo,10-15 min walk either side of Playa Blanca Beach along the prom and only a 2 min drive by car. 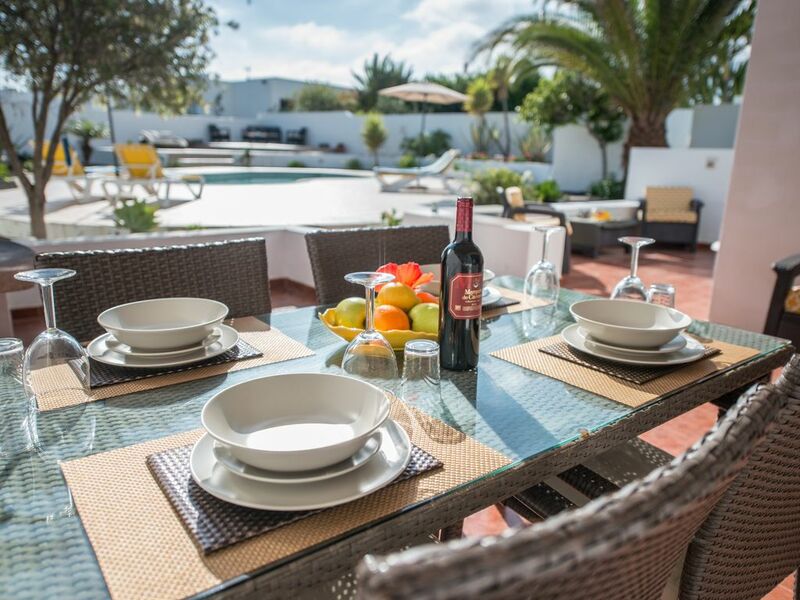 Perfect idyllic location as it is very peaceful & private still close enough to enjoy the very best of Playa Blanca's amenities and all that Playa Blanca has to offer..
Arrecife airport 20-30 mins drive. 10-15 mins walk into Playa Blanca Town centre and all shops/bars/restaurants and beaches. Booking Notes: These prices are for 4 people. To secure a booking a 25% deposit of the total price is required. full villa details and directions will be forwarded via e-mail balance becomes due 4 weeks prior to departure. A £100 security cheque is also required, but will be returned shortly after departure all being well if this villa is unavailable for your dates try its sister villa ref:c4274 (8088692) owners direct Changeover Day: Arrivals 7 days a week throughout the year, enter at 3pm and vacate for 10am (flexible depending on next clients arrival) Notes on prices: Prices are for the property per week in UK pounds.